Part 1: Oh Dear What Can I Do? T he article attempts to explain the details surrounding the refinishing of John Lennon’s 1958 Rickenbacker guitar, the instrument that has become synonymous with the sound of the British Invasion. The reseach associated with answering questions required to prepare this article has been extensive and spanned more than five years. The road travelled has largely been a virtual cold case file with sporadic but invaluable emails, “real” letters and telephone interviews illustrating the true power of oral history. One of the most famous guitars in rock music history has been John Lennon’s 1958 Model 325 Rickenbacker Capri (Serial Number “V81”) in natural finish. Purchased at Steinway’s in Hamburg, Germany in 1960, this guitar quickly became an Icon for the British Invasion. American guitars were highly sought after by British musicians during the late 1950s and early 1960s as young aspiring guitarists from the UK emulated American Rock and Roll with a passion that would create British Rock. John Lennon was not exempt from this fervour and acquiring an guitar made in America would be a dream come true. Lennon stumbled upon the 1958 Model 325 by chance, but it would be this opportunistic moment during a Hamburg trip in the autumn of 1960 that would forever link Rickenbacker instruments with the British Invasion. One of the more intriguing aspects of Lennon’s first Rickenbacker is the numerous modifications that he made to this instrument to control knobs, vibrato and refinishing. While this article focuses on the refinishing of his instrument from a natural to a black finish, a number of additional findings are also discussed, the first of which is the installation of the Bigsby vibrato. 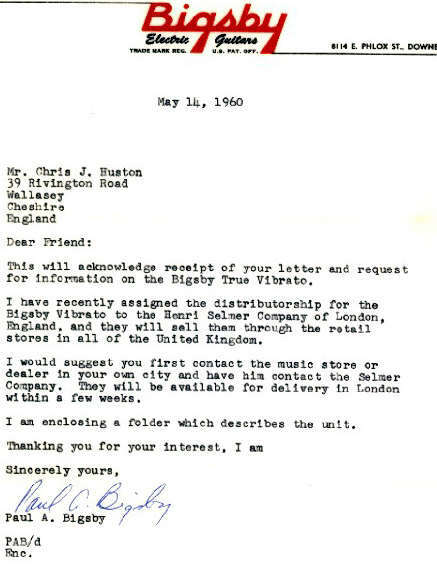 The Bigsby story begins, in part, with Lennon’s friend, Chris Huston, arranging to obtain a Bigsby from the United States. The details of which can bee seen in the letter below. Chris Huston, lead guitarist for the Undertakers and long time friend of John Lennon recalled John’s enthusiasm for American music and his Rickenbacker. Unable to find such an instrument in Liverpool, Huston remembers Lennon’s admiration for his guitar to this day. In short, John said, “It’s f—in’ great.” Unhappy with the Kaufman vibrato, John had his sights on a Bigsby vibrato. Huston had researched the Bigsby the previous year and had receiving information from Paul Bigsby in May 1960 as seen above. So it was then, in 1961 that John Lennon approached Chris while the Undertakers were performing on stage at the Cavern. “Chris! Me Bigsby’s in. I’ve got my guitar. 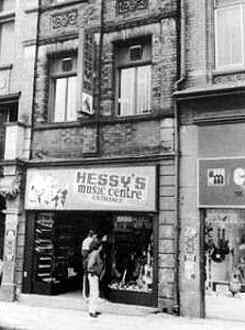 Let’s go to Hessy’s.” The two went to Hessy’s Music where they met Jim Getty and Huston asked for a screwdriver. Getty was more than a little bit surprised that Huston and Lennon were prepared to put on the Bigsby, right on the spot. Huston recalled the instructions that he gave to John. “John, put it here on the counter. You hold it and I’ll screw it on.” They lined up the Bigsby and screwed it in place and added Sonomatic strings, “My favourites” recalled Huston. It is not known whether Lennon continued to use “Sonomatics” but there is no doubt that they were put on the instrument that day. Perhaps one of the more elusive aspects of this famous guitar’s history, however, is the reason for its refinishing. So why was this guitar refinished, by whom and when? This article attempts to answer these questions based on the available documentation to date. Perhaps the single most elusive aspect of this famous guitar’s history, however, is the reason for its refinishing. So why was this guitar refinished, by whom and when? This article attempts to answer these questions based on the available documentation to date. While this is a story about what happened to a Rickenbacker guitar, it is also a study in part, of the fascinating life and unique character of John Lennon and his Liverpool home in the early 1960s.